In the craziness of life and business we try to cram a lot into little itty bitty blocks of time. Sometimes it works and sometimes it doesn’t. Other times we are on a roll, getting things done and it feels so good to cross items off our to-do lists that we push ourselves until the point of exhaustion. But where does that get you in the end? It is easy to get discouraged when we don’t get it all done and we wonder “what is wrong with me”? It’s time to evaluate your day. What got done that could have waited? What got done that wasn’t on my list. What did you notice in your answers? Did you try cram too much into your day? Was it an impossible list to begin with? Did you plan for the unexpected? Did you create and plan for margin in your day to accommodate the unexpected? What will you differently tomorrow? I’ll be the first to admit that asking for help is not the first thing I think of on the days I don’t get it all done. I’m not always sure what help I need! In my first business, as a virtual assistant, I would come across this scenario a lot. Clients would be stressed out and knew they needed help, but would be so busy they couldn’t think straight let alone know what to hand off to someone else. My advice would be to use these “I can’t get it all done” days as a starting point to see where you could use some help. On your list of things that DIDN’T get done: What do you dread doing? (maybe that is why it didn’t get done??) and what are you not good at doing? 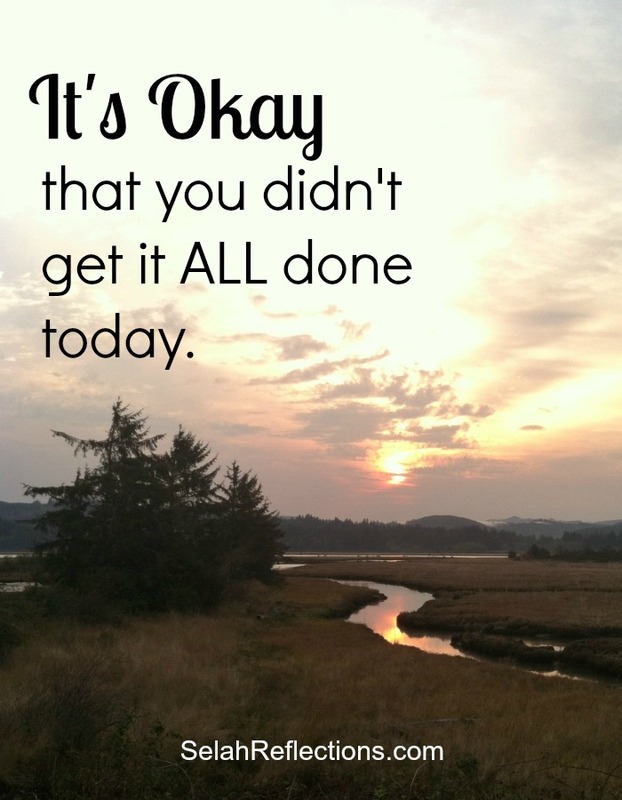 On your list of things that DID get done: What did you really not like doing? What would make your heart sing to get off your plate? Think of outsourcing from a different perspective. If you could hire some help, at a lower hourly rate than yours, wouldn’t that save you money in the long run? Increase your profitability and help maintain your sanity? Keep in mind that this doesn’t just apply to your business, it applies to your home life too. If you could have some help around your home for a few hours each month, what could you do to bring in more money during that extra time? OR possibly even better, could you rest, take a break and come back rested and ready to tackle your next goal? It does mean that you have carefully evaluated where you are at, what you want to accomplish and that you are putting together a plan of action on how to get it done. Ask for suggestions from friends, family, and your network of contacts. There is that silly word again, ask, it is such a simple, short word but one we don’t like to act upon. Trade services. Maybe it’s swapping child care afternoons, or maybe offering your products or services in exchange for someone else’s time. Find an intern at a local high school or college. Hire a virtual assistant for a few hours a month or on a per project basis. Hire a housekeeper to come in once or twice a month. It’s time to stop living in the fantasy world of “I can be all things to all people”. As women we have created a set of unrealistic expectations not only for ourselves for others too. How long and hard you worked has become a badge of honor. It’s time to give others, and ourselves, some grace and realize we don’t have to do it all. I can tell you it won’t be easy at first. You will probably experience some feelings of guilt and failure that you are needing help. That needs to stop. Instead of wearing the “badge of honor” of how long you worked yesterday, wouldn’t you rather say “I loved working in my business yesterday! I had fun, got a lot done and then I spent the evening doing _____ ”. Now doesn’t that sound wonderful? I kind of like that list and it’s okay that I didn’t everything on my list done today.